The San Rafael Swell is a large geologic feature located in south-central Utah about 30 miles (48 km) west of Green River, Utah. The San Rafael Swell, measuring approximately 75 by 40 miles (121 by 64 km), consists of a giant dome-shaped anticline of sandstone, shale, and limestone that was pushed up during the Paleocene Laramide Orogeny 60–40 million years ago. Since that time, infrequent but powerful flash floods have eroded the sedimentary rocks into numerous valleys, canyons, gorges, mesas, and buttes. The swell is part of the Colorado Plateau physiographic region. Interstate 70 divides the Swell into northern and southern sections, and provides the only interstate access to the region. The swell lies entirely within Emery County. The northern Swell is drained mainly by the San Rafael River, while the southern Swell is drained mainly by Muddy Creek, which eventually joins the Fremont River to become Dirty Devil River northeast of Hanksville, Utah. The Dirty Devil River flows southward into the Colorado River, while the San Rafael River joins the Green River before it also flows into the Colorado. Muddy Creek cuts into the western edge of the Swell, exits at Muddy Creek Gorge, and then flows across the Blue Hills Badlands near Caineville to its confluence with the Fremont River. The San Rafael Swell was formed when deeply buried Precambrian dike swarm rocks faulted, or broke, during the Laramide orogeny, about 60 million years ago. These "basement" rocks below the present-day Swell moved upwards relative to the surrounding areas and caused the overlying sedimentary rocks to fold into a dome-like shape called an anticline. The resulting structure is analogous to a series of blankets draped over a box. Since that time, the relentless force of running water has eroded the geologic layers, resulting in older rocks becoming exposed in the middle of the Swell, and younger rocks exposed around the edges. Many of the most impressive landforms are composed of more resistant rocks, including the Jurassic Navajo Sandstone, Jurassic Wingate Sandstone, and Permian Coconino Sandstone. The folding is much steeper on the eastern edge of the Swell than in the west, and this eastern edge is referred to as the San Rafael Reef. Both the San Rafael River and Muddy Creek drain out of the high Wasatch Plateau and the cut directly across the uplift of the Reef, which marks them as superimposed streams, pre-dating the time of the uplift. Part of the Swell has geographic features that resemble Mars. The Mars Society decided to set up the Mars Desert Research Station in the area as a Mars analog for such reasons. Evidence of Native American cultures, including the Fremont, Paiute, and Ute, is common throughout the San Rafael Swell in the form of pictograph and petroglyph panels. An example is the Buckhorn Draw Pictograph Panel, with rock art left by the Barrier Canyon Culture and the Fremont Culture. From about 1776 to the mid-1850s the Old Spanish Trail trade route passed through (or just north of) the Swell. In the past 150 years, areas of the Swell have been used for the grazing of sheep and cattle, as well as for uranium mining. Many of the gravel roads in the interior of the swell were originally used to service the uranium mining activities. Although surrounded by the communities of Price, Green River, Hanksville, Ferron, Castle Dale, and Huntington, the Swell itself does not support permanent residents. The Swell has been used by Hollywood filmmakers as a location setting for alien planets, including the Planet Vulcan in the 2009 film Star Trek and the alien world in Galaxy Quest. The area is managed by the U.S. Bureau of Land Management. Although the Swell as a whole does not currently enjoy special protection, parts of it are protected as wilderness study areas. Cattle grazing is only allowed in parts of the Swell that are not designated as such. The San Rafael Swell is also dotted with sections of land managed by the Utah School and Institutional Trust Lands Administration, as is much of the state of Utah. Goblin Valley State Park is on the southeastern edge of the San Rafael Swell. 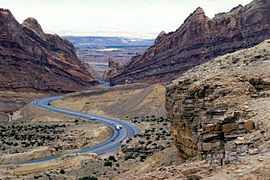 In 2002, then-governor Mike Leavitt of Utah proposed the creation of a San Rafael Swell National Monument. President George W. Bush, who had authority to create such a monument under the Antiquities Act, never acted on Leavitt's proposal. Aerial view of San Rafael Desert. Goblin Valley is at lower extreme right, with Wild Horse Butte to the left. The shadow of a contrail marks the San Rafael Reef, with the Swell behind it. ^ Pediocactus despainii. Archived August 29, 2011, at the Wayback Machine Center for Plant Conservation. ^ "Canyoneering the San Rafael Swell - Route Guide". Climb-Utah.com. ^ Achey, Jeff. "The Sandstone Alps". Climbing Magazine. Retrieved April 19, 2019. Wikimedia Commons has media related to San Rafael Swell.